The other day I received a fun little package from Julie over at The Intrepid Thread. 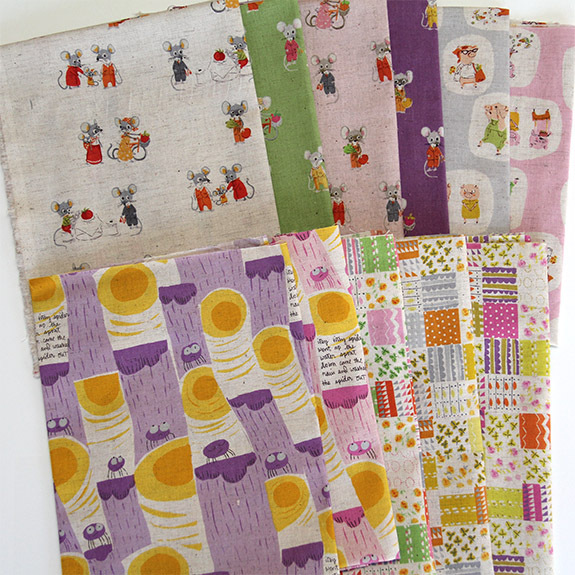 She carries Nursery Versery and has most prints from the line. I love the mice. They are my favorite. All the prints are so sweet. I dove right into them. I wanted to do something super simple with these cute prints. I didn't want to cut too much because of what you lose in the design. I ended up cutting into 6 1/2" squares and making a very simple charm quilt. I plan to use the remainder of the FQs for a pieced backing. I mixed in a bit of Essex Yarn Dyed Flax which is my new favorite linen blend. I love the Essex Natural, but have found it to be a bit scratchy. The Flax is so soft and nice. I think I will convert to a new color. I got mine from Tammy over at Marmalade Fabrics. I love having a quick simple project that comes together so easily. I rarely do this type of quilt. It was a nice change to finish a quilt top in just a couple hours. 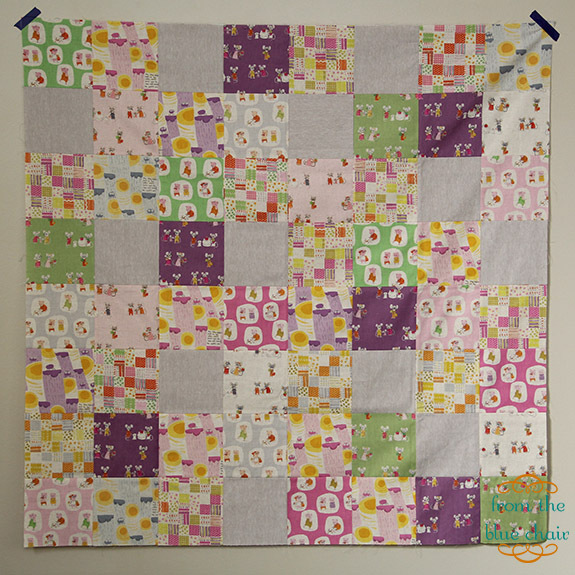 The other night the hubs asked if I would be able to make a baby quilt for a friend from work whose wife is having a baby girl in January. My question to him was, "How good of friends are you?" A Heather Ross quilt can't go to just anyone. 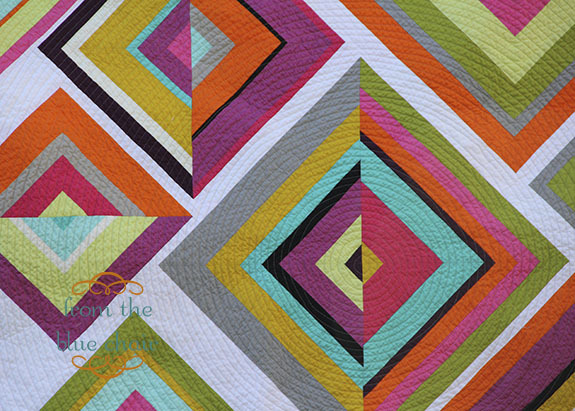 On a side note, my Broken Diamonds quilt has been nominated for the "Favorite Throw" category over at the Bloggers Quilt Festival. I was excited to be among the finalists. Voting is open for a few more days. Head over and vote for your favorites! So cute! 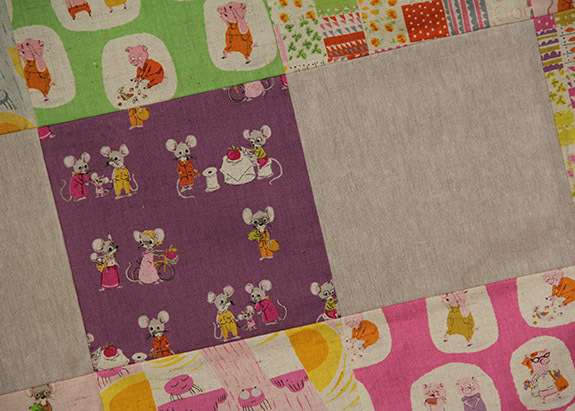 Simple patchwork is one of my favorite ways to put a quilt together. Congrats on the nom - it was one of my picks, for sure! I love the way the fabrics just fit, it is a nice come together quilt. congrats on the nomination, that is a great quilt. Super adorable Katy. Good luck in the BQF. lol "how good of friends are you?" You're right! You've got to use that precious fabric for the right people. Love it! Some fabrics are so pretty that simple is best. I just voted for your quilt because it's amazing. Congrats on the nomination and hope you win! So glad to see your quilt nominated! Hi Kati! Just want to congratulate you for your Bronken Diamonds Quilt nomination!!! Just heading there right now to vote!! Good luck! Funny - that's the same question I ask my husband! Love your Broken Diamonds Quilt!